So the open borders cheap labor party outs itself much like the party of child murder outed themselves last week. This is really laughable to me. The President doesn't even have to declare an emergency to set aside millions of acres of federal land "with the stroke of a pen." The Republicans controlled Congress for two years with a Republican in the White House and what did they do about this extraordinary power? Absolutely nothing. Senate Committee Chairman Murkowski introduced S. 33 to limit the President's authority in this area and never even held a hearing on the bill! And now they are going to revolt if the Trump exercises his authority to build a wall? Disgusting. I am not one of those who believes a wall will solve our illegal immigration problems. But I do believe it is one of several tools that can be used to better manage the problem. I also believe the Congress has delegated far too much power to the Executive. However, for the R's to stand up for Congressional prerogatives, now, and on this issue, is simply sickening. Ah, so someone did an emergency spinectomy on McDorkell after he showed signs of regrowing one. The GOP - with an uninterrupted history of snatching defeat from the jaws of victory. Congress should go back to sleep! That’s because the GOP is against border security also. The establishment all have the same mind set. And here we see why we never got a wall built in the first two years of the Trump presidency, with Republicans in control of both the White House and both houses of Congress. 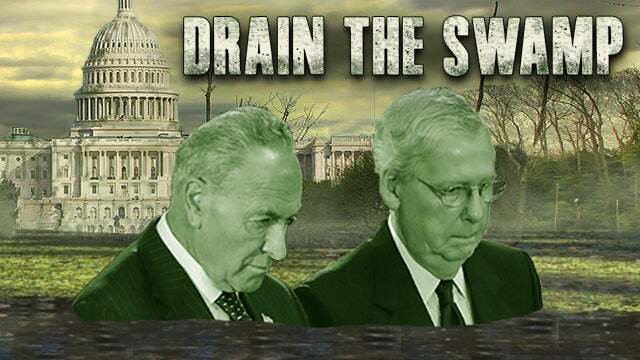 McConnell needs to get his caucus under control to support the president, or he will see his Senate majority dry up and blow away in 2020. Hopefully Trump defies both the Democrats and the Republicans, declares an emergency, and builds the wall. The courts aren't going to allow it anyway (cue the foolish, "He'll ignore the courts" remarks, remember, he never has) but if the Senate is against him, it's almost a death wish. The deep state has spoken. No wall. Oh my gosh! A veto! A Trump veto would be the end of the civilized world! GOP Florida Sen. Marco Rubio said that an emergency declaration was a terrible idea and that he would oppose it. The GOPe STILL doesn’t understand Trump is all they have between victory and udder destruction as a party. Craven is the word I want to use here. McConnell is the poster boy for how the Congress has failed the American people for 30 years because the Republicans wanted the cheap labor and the Democrats wanted the votes. In a national emergency he has to vacate lower court rulings. The Uni-party itself is the Anti-Christ. They want Lawlessness to become Law!